An HD video of the forthcoming Android phone from Samsung, the i7500, has surfaced and details a few interesting features that the previous HTC efforts failed to manage. 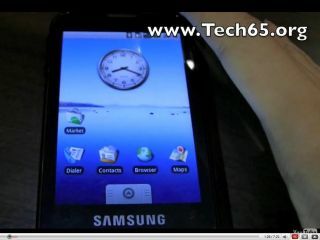 At a recent bloggers event in Korea attendees were treated to a little surprise, namely the chance to have a hands on with the Samsung i7500, and website Tech65 posted a neat hands-on video. It takes us through the features of the latest Android phone, including showing off a multi-angle accelerometer, twisting the phone's display to whichever way round you hold the phone, even if you decide to look at it upside down. The OLED screen looks sublime, as it has done with its Omnia HD and Tocco Ultra Samsung brethren, and certainly the right screen to show off Android's colourful interface (and makes us certain there's no way Apple can release a new iPhone without OLED). It's obviously sporting Android's 1.5 Cupcake upgrade, as it comes without a QWERTY keyboard so the on-screen version is paramount, and the touchscreen looks responsive without being stellar (although if it's anything like the HTC Magic then it will be brilliant, as we found in our recent review). The video also highlights the presence of a 3.5mm headphone jack, so no need to fiddle about with a separate adaptor just to listen to your tunes, once again making us question why HTC couldn't manage the same thing. Check out the video yourself over at Tech65 or YouTube if you fancy a bit of HD viewing (which of course you do... if you're like us you'd watch a brick wall in HD just because).